Pressure sensors are used across a variety of industries to provide accurate, real-time data of how a process or system is operating in a given application. But how can you tell if your data is accurate? The most common method to ensure the accuracy of a sensor output is to calibrate your sensor against a higher accuracy pressure sensor (calibration standard). Now, how can you tell if your calibration standard is accurate? This is where measurement traceability plays into the calibration process. “Traceability refers to the value of a standard where it can be related to stated references (national or international standards) through an unbroken chain of comparisons, all having stated uncertainties (ISO)”. To simplify, measurement traceability is a method of ensuring that a measurement is taking into account all uncertainties and is an accurate representation of an object being measured. The basis of this method is that a measurement should be tested against a higher calibration reference standard. One common misconception with traceability is that the measuring equipment is traceable, however only the result of the measurement or the value of a standard is actually traceable. It should be possible to demonstrate an unbroken chain of comparisons or trace back the accuracy value to a primary standard, at SI (international standard). 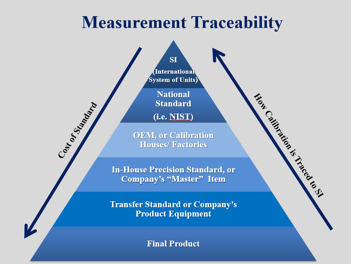 Figure 1 demonstrates the typical calibration hierarchy for measurement traceability. Each level in the pyramid should be calibrated using a standard from the tier above. When moving up along the hierarchy, or with each traceable calibration, it is a best practice to maintain a 4 to 1 accuracy ratio; the accuracy should be four times closer to the ideal accuracy of the higher standard. For example, if a customer’s sensor has an accuracy level of 0.2% FS, it should be calibrated against the transfer standard, with an accuracy of 0.05% FS (0.2%/4) or better. It is important to keep in mind that, as you move further up the pyramid, the time to calibrate and the cost of calibration equipment increases as well as the accuracy. Also remember that each calibration standard level is not compulsory. For example, a US customer can send a sensor for calibration to NIST without previously sending it to a calibration house, however this is typically a more costly option. Why is Measurement Traceability Important? Simply put, calibration to a traceable standard validates a sensors’ accuracy and any associated uncertainties. Measurement Traceability is important for providing assurance of the sensor’s accuracy to both a customer and manufacturer for a given process. Establishing that a sensor’s accuracy is traceable to a higher standard gives credibility for manufacturers, validating the accuracy of their results to their customers. Traceability ensures that a manufactured part or calibration is accurate and will meet the desired specifications for the application. International Organization for Standardization. International Vocabulary of Basic and General Terms in Metrology. 2. Geneva, Switzerland: ISO; 1993. CLICK HERE to learn how often a sensor should be calibrated.